alaTest ha recogido y analizado 50 comentarios relacionados al producto Philips Hue Colour Ambiance Wireless B22 LED Starter Kit. En promedio, la calificación para este producto es 4.9/5, al ser comparado con la calificación 4.5/5 de otros productos en la categoria productos. Analizamos las valoraciones de los usuarios y los expertos, la edad del producto y demás factores. Comparado con otros productos el Philips Hue Colour Ambiance Wireless B22 LED Starter Kit recibe una alaScore™ global de 89/100 = calidad muy buena. The bulbs look and work great with the iOS app. 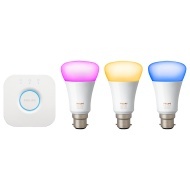 I felt they are slightly expensive but I'm sure they are the best in business of smart bulbs. I would love to buy more bulbs in the future but definitely not the colour ones considering the cost. Easy to set up and work like magic. Colour combinations and disco lights (with add on app on your phone via AppStore) were instant hit with kids and adults alike. Fully recommend this product. I'm living in the future!!! Love these lights, have combined them with echo to have voice control. These are just awesome can't recommend enough. Expensive light bulbs but worth every penny.